Saaho is an upcoming 2019 Indian multilingual action-thriller film directed by Sujeeth. The movie stars Young Rebel Star Prabhas aka Baahubali and Shraddha Kapoor in the lead roles. Saaho is the biggest film in Prabhas’s career after epic Baahubali. Saaho is the biggest film of Telugu Film Industry as well as Prabhas’s career after Baahubali. The movie is being made on a very huge scale and it is expected to give tough competition to some Hollywood biggies in terms of action and cinematography. Saaho budget is around Rs 150 crore which is also one of the highest in the history of Indian cinema. UV Creations is bankrolling this mega budget prestigious project which is expected to do some extreme wonders at the box-office. Prabhas will be seen playing the role of a high profile police officer in this action-thriller film. 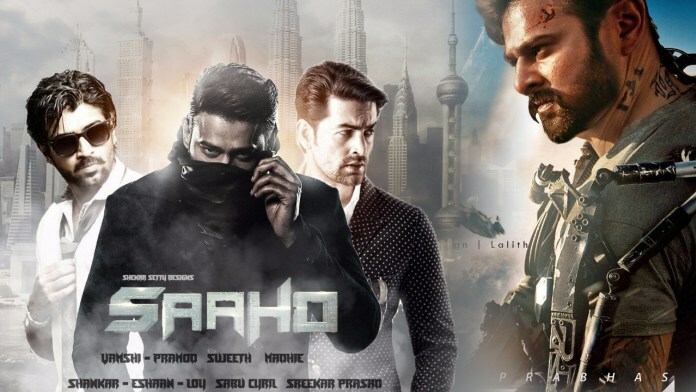 Saaho story revolves around Saaho, played by Prabhas, who uses a jet peck, created by his scientist father, to defeat the drug mafia and goons. The movie will feature Shraddha Kapoor playing dual roles. Neil Nithin Mukesh is the main antagonist in Saaho. Saaho release date is yet to be announced but as per the media reports, the makers are planning to release the movie in January 2019 to cash in the Sankranthi weekend. If not in January, then it will definitely be released in Summer 2019. Saaho will be released in Hindi, Telugu, Tamil and Malayalam simultaneously. Saaho went on floors in June last year and the team has already wrapped up a huge part of it’s shoot. The remaining portions will be shot by August this year and then the post-production work would begin. Saaho first teaser was released in April 2017 which was showcased with Baahubali 2 across the world. It got mind-boggling response from all over as it featured the actor in a never seen before avatar. The teaser was released in four languages.